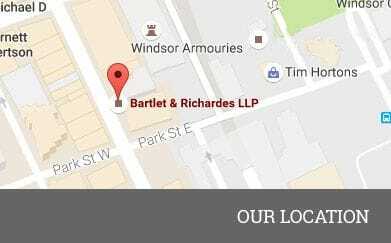 BARTLET & RICHARDES LLP - ARTICLING F.A.Q. Is there an articling position available at Bartlet & Richardes LLP (the "Firm") for the 2020 - 2021 year? Applications for an Articling position must be submitted by Friday, May 3, 2019 in order to qualify for the one Articling position we offer. Will Bartlet & Richardes LLP be hiring future Articling Students? Yes, one student will be hired and applications for the next articling period (2020-2021) will be considered in accordance with The Law Society of Ontario Licencing Process. I want to apply to your Firm what materials should I send; who should I send them to and when should they be sent? letters of reference are not required but if you wish to include same you may do so. If you have any questions with respect to the materials to be forwarded or the timing of same, please contact Jennifer at (519) 253-7461. I've applied to your Firm what should I expect next? We will acknowledge receipt of your materials by email or letter. We then conduct interviews of selected candidates in accordance with the Law Society of Ontario's guidelines. The timing of the interviews is dictated annually by the Law Society of Ontario (further information is available on its website www.lso.ca). Given the number of applications we receive each year, we are unable to interview all candidates that apply. If you are selected for an interview, you will be contacted by our office to arrange a mutually convenient time within the interview period set by the Law Society of Ontario. Are you hiring summer students (i.e. students between first year and second year)? Currently we are not hiring summer students. Why hire only one student ? Our goal is to provide each student with an excellent experience. Given the number of lawyers currently working at the Firm and the nature of their respective practices, we have enough appropriate work to provide two students with a good experience or one student with an excellent experience. We prefer the latter approach and can state, with confidence, that when a student completes our program, the student will have acquired a tremendous amount of quality practical legal experience as well as a proficient understanding of the business side of the practice of law. In short, the student will be ready to enter the world as a competent legal practitioner. In which areas does the Firm practice? We are a full service firm practicing in every area except criminal litigation. In broad terms, members of the Firm are evenly divided between corporate/commercial law and civil litigation. Our corporate clients include several manufacturers and tier one auto parts suppliers, transportation companies, contractors, hospitals, a community college, a railway and professional service firms. The nature of our commercial practice is diverse and interesting, providing a comprehensive experience for the student. Our litigation department is primarily insurance-based (insurer side). We also engage in estate, construction, family, commercial, labour (management side) and corporate governance dispute resolution (including litigation, mediation and arbitration). What is the philosophy underlying the Firm's articling program? What type of experience does the Firm's articling program offer? We view the articling experience as your fourth year of law school. It is the first sustained opportunity that most students have to apply the theoretical knowledge acquired in law school to practical use, assisting in finding legal solutions to actual legal issues. Our responsibility is to help the student make the transition from law student to practicing lawyer. thorough understanding and compliance with the Law Society of Ontario's Rules of Professional Conduct. We believe that the two primary methods by which a student learns are observation and participation (i.e. learning by doing). Our student will have the opportunity to observe by attending at various file events including meetings (client, expert, witness), examinations for discoveries, mediations, motions, arbitrations, settlement/pre-trial conferences, trials, transactional closings (and preparation for such closings). Advocacy and interaction styles are different from lawyer to lawyer. Accordingly, the student is encouraged to attend as many of these types of events with as many different lawyers as possible in order to observe different styles at work. Over the course of time, the student will develop his/her own style. The student will have the opportunity to draw on the elements of each style which he/she feels are effective. The student will also have a tremendous opportunity to participate actively in the conduct of legal matters at the Firm (all within scope of tasks which are permitted to be delegated to articling students by the Law Society of Ontario). For instance, the student will be primarily responsible for the conduct of the Firm's Small Claims Court files, including opening the files in accordance with the Firm's file procedure, direct communication with clients, all legal matters (from pleadings to judgment and all steps in between, including the conduct of a trial, if necessary), as well as time tracking and account preparation. While that may sound intimidating to some, fear not. The student will perform all of these functions under the direct supervision of a lawyer at all times. In other words, the student does not work without a net. The student's work is reviewed at each stage with constructive feedback from the supervising lawyer. By the time the finished product reaches the client, the court, or opposing counsel, it will be well polished, having been vetted internally prior to release. Involvement in corporate and commercial matters tends to be more task and transaction specific. We do not expect that the student will produce perfect results on the first try in each task assigned. Such expectations would be unrealistic and unfair to the student. However, we do expect a thorough and solid effort from the Student on all tasks assigned. The key to success in our program is a willingness to try, and to learn from one's mistakes. Experience dictates that, if a student consistently applies that standard throughout his/her articles, the student will develop the skills necessary to become effective counsel. We operate with an open door policy at our Firm. We encourage our students to ask questions, no matter the issue, and each of our lawyers is generally available for questions/discussion. We consult one another informally on a day to day basis and our student is encouraged to do so as well. I've heard "horror stories" about articling students being subjected to long hours, mundane administrative tasks, deliveries, etc. (none of those stories involve your Firm, of course) should I be worried about those types of things ? No. You should not be worried about those types of things at our Firm. The practice of law in Essex County is typically conducive to supporting a well balanced lifestyle between work, family and recreational pursuits. That observation is predicated on working hard while at work. However, each of the members of the Firm recognize the importance of having interests and pursuits outside of the practice of law and, more fundamentally, having the time to engage in those pursuits. We believe that our Firm maintains that balance quite well. One has to realize that the practice of law can never truly be characterized as a nine-to-five job. Often a lawyer's hours are dictated by the immediate needs of his/her clients. With appropriate planning and time management skills, however, the lawyer can accommodate a demanding practice and still have a full and rewarding life. We strive to teach our students these skills. I am often asked by prospective articling candidates "What are the expected working hours of our student". My typical response is that, like the members of our Firm, the student is a professional. No one will be actively monitoring when the student starts and finishes precisely each day (however showing up consistently to start the day at noon is typically frowned upon). If the student is present for business hours, meeting deadlines for assignments, has a firm handle on active files and is making a genuine effort to learn and improve his or her skills, we will be satisfied. We make active efforts to avoid assigning the student mundane tasks such as filing, photocopying, or being a de facto courier service. Those types of functions are not conducive to our goal of assisting the student's transformation to a competent practicing lawyer. As an articling student, will I be paid a salary? If so, how much? Yes. You will be paid a salary. The salary amount is fixed each year and is best described as the "going rate" for Essex County. The specific figure will be available during the interview portion of the application process (more on that below). Is the articling student afforded medical benefits at the Firm? Yes. Our student is eligible for our Greenshield extended health care coverage for the duration of their articles (particulars will be available during the interview stage of the application process). What is your Firm's hire-back ratio? We do not have a formal hire-back ratio. As indicated above, the primary goal of our articling program is to assist our student in making the successful transition from law student to practicing lawyer. Having said that, our articling program is also a key component of our Firm's associate recruitment strategy. When we evaluate potential associates, we consider a number of factors including the Firm's current and projected future needs, the ability of the candidate and the general fit between the Firm and the candidate. Each of these criteria is more readily assessed with an "in house" articling student with whom we have had the opportunity to interact for 10 months. Similarly, the student is able to make an informed decision as to whether a practice with our Firm accords with his or her long-term career goals. Currently, five of our nine partners and three of our seven associates articled with the Firm. How much feedback will I receive throughout the year ? Short answer: As much as you want. Long answer: Generally the student will meet with the articling principal at the beginning of the year to review the articling plan and identify the type of work the student is interested in pursuing. The principal will follow up with lawyers practicing in the areas in which the student is interested and encourage those lawyers to involve the student in as much file activity as possible. The student will, of course, interact with and receive assignments from all lawyers at the Firm. The student and the principal will have two or three formal progress meetings throughout the year. At those meetings, the principal will provide general feedback on the student's progress to date and receive feedback from the student with respect to the quality and quantity of work received to date. The student and principal will meet toward the end of the student's articles to review, from the student's perspective, the quality of the student's experience in the articling program. The principal will be available throughout the term for informal meetings and discussions, at the student's request, to discuss any aspect of the articling experience or any file-specific matter. The student is not limited to seeking advice and direction solely from the principal, but is free (and encouraged) to discuss articling or file-specific issues with any of the lawyers at the Firm. How much research will I be expected to conduct throughout the year? Research is an important component of the articling experience at the Firm. However it is not the only component. The student will be asked to conduct some research. The objective of research is a legal answer. The role of counsel is to provide the client with a legal solution. Undoubtedly, research is a critical element of a successful legal practice, but the art of law extends far beyond that. We do not believe that having a student spend the majority of his or her time in a library or online conducting research assists the student in making the transformation from law student to practicing lawyer. Instead, the majority of the student's time should be spent learning the practice of law by observation and actively working on files. In other words, developing the skills necessary to provide clients with not only legal answers but also legal solutions. Will I have independent responsibility for files (and will I have the opportunity to go to court)? Yes. The Firm maintains a moderate volume small claims practice. The articling student is responsible for the day to day handling of those files, from pleadings to trial to enforcement of judgments, under the direct supervision of one or more of the Firm's lawyers. That practice affords the student the opportunity to develop not only written and verbal advocacy skills, but the practice management and time management skills that are essential to the successful practice of law. In addition, the student will have the opportunity to prepare for and argue simple interlocutory motions in the Ontario Superior Court of Justice, and may assist with and attend at mediations, arbitrations and administrative tribunal hearings such as the Ontario Municipal Board.